How To Stop Waiting For Change and Start Creating It. Because Your Life Belongs To You. Can just ONE mindset shift can take you from hesitation and wishful thinking, to unapologetically owning your life and taking powerful actions every day? Own It All has a simple answer to that question: hell yes! Own It All is what you need. This book is one-part manifesto + one-part workbook + one-part interview collection, featuring insightful conversations with business leaders like: Ashley Ambirge, Susan Hyatt, Esther Fairfax, Alexia Vernon, Katherine North, Nick North, Kimmie Smith, and many others. 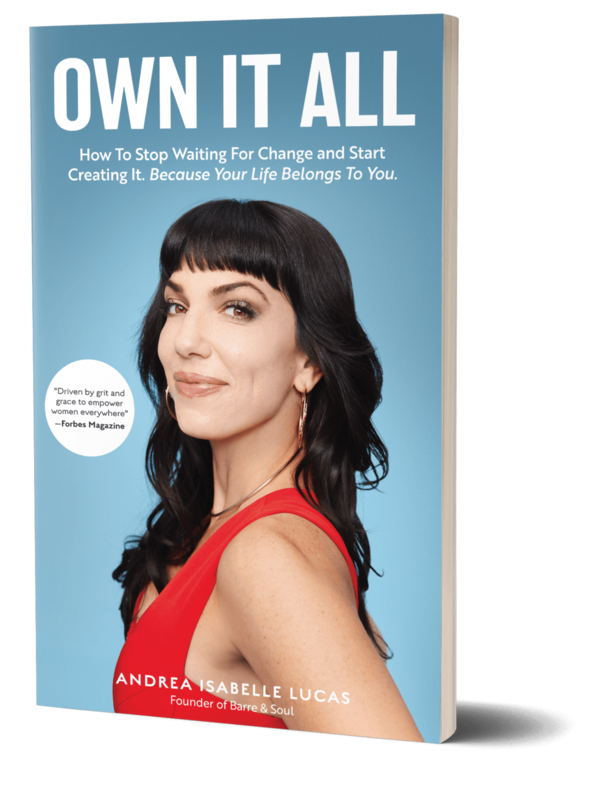 Over 8 zero-fluff chapters, Andrea Isabelle Lucas will show you how to claim your personal power, firmly stand in your ambitions (career, motherhood, health & wellness, all of it), and become the creator of your ideal life - because you’re done with waiting for permission! This book is the cure for procrastination. This book will zap self-doubt and playing small. This book is a jolt of “I’m a freaking badass!”, and a practical guide to living life on your terms. It’s time to Own It All. "Full of concrete, incredibly actionable tips for setting goals and actually achieving them, this book is a must-read for anyone who's shooting for the stars." How to take responsibility for where your time is going, prioritize like a boss, and redirect your time towards the goals and experiences that really matter to you. How to release “mom guilt” and pursue whatever kind of career you want, even if you’ve got kids at home. What it really means to “forgive”—forgiving other people, forgiving yourself—and why forgiveness is such a gift for your health, for your stress levels, for your spirit. Why sometimes we have to do something “crazy” in order to release the past and move forward with your legacy. Andrea Isabelle Lucas is the founder and CEO of Barre & Soul® (a boutique chain of innovative yoga and barre studios that are about to go national), and a keynote speaker who’s shared the stage with Michelle Obama and Billie Jean King. Her voice is inspirational and down-to-earth. Feminist and unapologetic about it. Empowering, with a badass spirit and cat eyeliner for days. Andrea has journeyed from a teen single mom, former stripper, domestic violence and personal poverty survivor, to the creator of a multi-million dollar business - her studios were recently awarded the prestigious Best of Boston Award 2018. How’d she do that? She made one mindset shift that created a massive snowball effect, propelling her from one powerful achievement to another. Own It All is where she pulls back the curtain and shows you exactly how she did it, so you can do it too.